At Leo & Son Garage, our ASE Certified technicians specialize in hybrid repair. Bellflower area drivers value being environmentally friendly, which is also important to the team members at our shop. For that reason, we have the training to provide repair for all hybrid vehicle makes and models to ensure that your car maintains the fuel efficiency you have come to expect. The technicians at our shop are equipped with the specific tools and equipment necessary for high-tech hybrid repair. 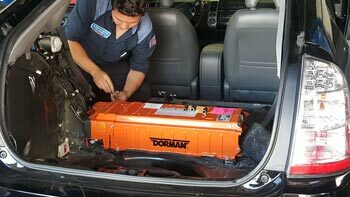 From battery testing to drive motor testing, our team can perform the specialized service your vehicle requires. In addition, we use hybrid-specific parts to ensure your vehicle performs its best during your commute in and around Bellflower. Hybrid repair services are backed by a 3 year/36,000 mile warranty, so you can be confident in our service. We know that one of the benefits of a diesel engine is the options for high performance without producing high levels of emissions. In California, your vehicle is required to pass a smog test to help reduce the amount of pollutants in the atmosphere. Our Bellflower diesel repair technicians are Star Certified to perform smog check testing and make sure that your diesel vehicle meets state standards. Hybrid vehicles are becoming more and more common on the roads these days. With virtually every major automotive manufacturer having at least one hybrid car in their line, the instability of gas prices and people's acceptance of the technology quickly rising, their sales have risen at an astounding rate. Unfortunately for you, if you have taken the hybrid plunge, not all automotive repair shops have kept up with all of the latest developments in this quickly changing sector of our business. Too many are now scrambling to catch up or still think working on a hybrid vehicle is no different than any other vehicle. The truth is that the Hybrid Drivetrain of your car is different from a standard gasoline or diesel powered vehicles and requires a special service to be kept in tip top condition. Beyond that, while every car company has their own unique way of doing things. When it comes to their hybrids, the differences are even greater than with standard models. We have a team of certified technicians who know hybrids. From the very first models that hit the streets, we could see that this wasn't going to be a passing fad. Gas/electric hybrid vehicles were an idea whose time had not only come, but was a natural and inevitable evolution of our industry. Due to this, we’ve dedicated ourselves to being the leading hybrid service and repair experts from those very days until now. Through continuing education and hands-on training, we have made certain that our repair technicians are the best in the area. When your hybrid vehicle is in need of service or heaven forbid repair, you don't want someone working on it that still wishes hybrids would just go away. You want someone who is dedicated to knowing and understanding exactly how and why your vehicle works the way it does and what it takes to keep it in perfect working order. You will find those people at our shop, where we have supported and serviced Hybrids from the beginning.